Painted by local artist Jane Worthington who has really captured the pretty, quirky look of our shop. The Donneraile Room, perhaps our favourite at The Grove complimented by these Flowers & Candles. We're a preferred florist at The Grove, photo of a Chuppah in The Amber Suite. The Light and Airy Ivory Suite with Fresh Yellow, White and Green Table Centers. It is not always possible to supply the gift you choose exactly as the photo. What I can promise though is the photos represent the high quality of design and flowers that we use at all times and your gift will look as close to the photo as possible, colour, type of flower etc. and to the same value as chosen. If we are unable to provide a close match to your chosen gift we will contact you to discuss other options. 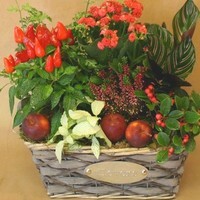 There should be something on our website you like but perhaps you'd like to leave the flower/plant choice to us? 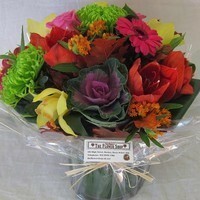 There are many 'Florist Choice' flower options, just select a price you'd like to spend and leave the rest to us. If you do have any comments to make regarding the order process or website in general I'd welcome hearing them. We do have a Feedback and form on the Contact Us pages on the site. "Working with flowers, plants & imagination.©"
Over forty-five years ago the first Flower Shop was opened at 102 High Street, Bushey and we have now been trading in the same premises for twenty years. 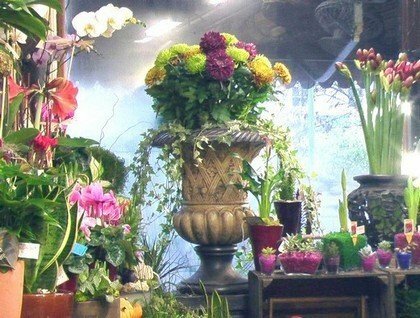 A family owned Bushey florist with artistic, talented designers and a pedigree in floristy stretching back four generations, safe to say floristy is in the blood AND bricks and mortar. Good to see the joy of flowers has infected our son Sam. He came to help when we first opened our florist in Bushey, stayed and he now manages our Watford florist. The passion for flowers and what can be created is undimmed and our love of flowers is displayed in a large and very varied selection of the best that the New Covent Garden Flower Market, the Dutch Auction Houses and local growers have to offer. 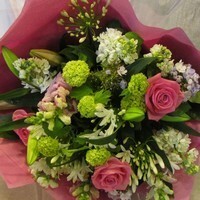 Martin, Susie, and the rest of our team, thank you for your visit to our Bushey Flower Shop's website. "Your Local Florist with a National Reputation.©"
Our sister shop, delivers further into Hertfordshire than we do. Contact Sam for a flower delivery in these areas. Monday-Friday 9am-5:30pm; Saturday 9am-5pm; Sunday CLOSED. Certainly, please tick the appropriate box and note approximate collection time in the 'Any requests..' box. Are delivery times for funeral orders guaranteed? Yes. Flowers are delivered 2 hours before they are needed. We will contact the funeral director/crematorium to arrange a delivery time for a early funeral. Are delivery times for my gift guaranteed? A 'Priorty 3 hour delivery' service at a cost of £10.00 is available. £5.00, same or future date to all listed delivery areas. Yes, if order is received by 2pm. What if recipient is not in? 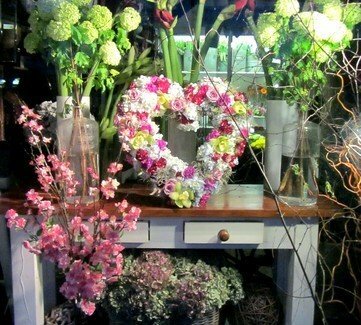 Flowers will be left with a neighbour, in a safe secure place or returned to the shop. A 'while you were out' card will be put through the door and if you provided a phone number they will be called. If we do not hear from the recipient you will be contacted. Are the flowers arranged and delivered by The Flower Shop? Yes. We DO NOT post or transmit your orders to any other companies. All orders to the delivery areas listed are arranged and hand delivered by ourselves. 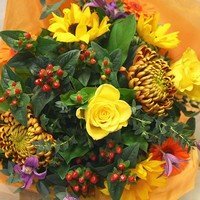 If you wish a delivery elsewhere in the country search the web for a local florist or contact Interflora. When possible and if the price is right, minium order value £40 + £10 delivery charge we can deliver further-a-field. 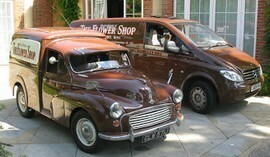 Please phone, during shop hours, 020 8950 3384 or send an email to check we can deliver for you. Clean and fresh, hydrangeas, roses and all things nice. 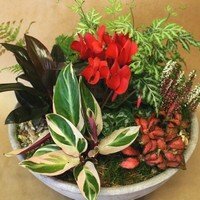 On this page, the Arrangement of the Month is always worth checking out and examples of Bouquets, Flower Arrangements and Plants & Planted. Use the Top Menu for links to these and Anything extra? for Balloons, Teddy's Chocolates etc. Thanks for your visit, if you want to know more our Facebook, updated regularly, and About Us pages may appeal. 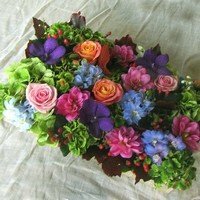 Shown on this page, the Arrangement of the Month - well, we do try to update monthly - is always worth checking out and examples of Bouquets, Flower Arrangements and Plants & Planted. Use the Top Menu for links to these and Anything extra? for Balloons, Teddy's Chocolates etc. 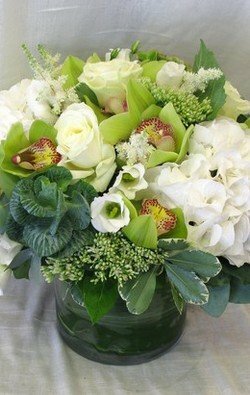 Refer to the Menu also for links to our Wedding, Event and Funeral Flower pages. Thanks for your visit, if you want to know more, our Facebook, updated regularly, and About Us Pages may appeal. These Terms and Conditions govern your use of the Flower Shop Site and Service. Flower, plant and related products. In the event that we are unable to supply the product or any substitute product we shall notify you as soon as is reasonably possible. You shall be required to provide us with your personal details, including accurate postcode, together with those of the intended recipient and all necessary payment details. By clicking on the 'Confirm Order' button on the Order Form, you are consenting to be bound by our terms and conditions contained in these Terms and Conditions. Incorrect personal details may lead to problems or delays in delivery, so before placing your order, please ensure that you have included the full address details, including accurate postcode of the intended recipient and your daytime contact telephone number or e-mail address so that we can notify you in the event that any delivery problems are encountered. Delivery to certain locations such as hospitals and care-homes may have to left with a third party this shall be accepted as proof of delivery to your chosen recipient. Orders may be amended or cancelled up to 12 hours before the intended delivery date. To amend or cancel your order, please contact the Flower Shop from 9am until 5.30pm Monday to Saturday using the contact details set out below. Payment is due thirty days from receipt of bill. Account facilities may be withdrawn immediately following non-payment of bill and steps taken to recover any monies due. Accounts may also be withdrawn following thirty days notice.